Effective chest compressions without the fatigue. Defibtech is proud to introduce the Lifeline ARM Automated Chest Compression (ACC) device. The Lifeline ARM is used to perform mechanical chest compressions when effective manual CPR is not possible. It is common knowledge effective cardiopulmonary resuscitation (CPR) is attainable when a high level of efficacy is achieved. This is necessary in order to have an impact on the survival rate of a cardiac arrest victim. Effective CPR is very difficult to achieve manually when fatigue can occur in as little as 1-2 minutes while trying to maintain at least 2 inches/5 cm depth compressions at a minimum rate of 100 compressions per minute. In a rescue situation, the Lifeline ARM, when used as a complement to manual CPR, provides extended CPR with minimal interruptions when fatigue, insufficient personnel, or patient transport (e.g., ambulance, intra-hospital) may inhibit the delivery of effective/consistent chest compressions to the patient. 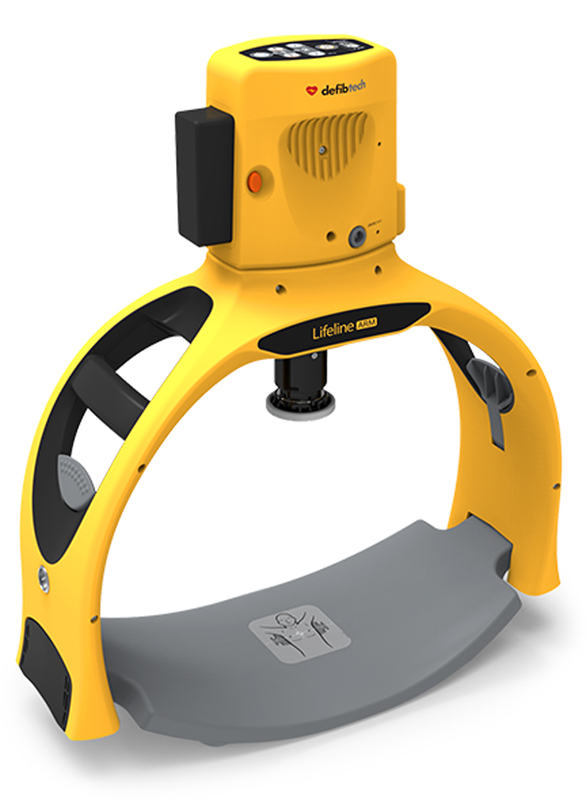 Its award-winning design provides portability, speedy deployment, and delivers precise CPR with unmatched operating times. Time is critical in a rescue. The superior design of the Lifeline ARM provides easier assembly, fewer steps to initiating compressions, minimized interruptions, and robustness during operation. With state of the art features, functions, and ease of use, the Lifeline ARM is an unsurpassed solution for automated CPR. Designed for the ruggedness and durability demands of the professional first responder, the Lifeline ARM delivers portability, quick deployment, and ensures high-quality CPR. The result is a truly useful product to help save lives. The Lifeline ARM features a state-of-the-art Compression Module paired with a specially designed Frame. During operation, a smart, software driven, motor control algorithm ensures compression depth and rate consistency by compensating for variability in chest resistance ensuring CPR efficacy. The structural design and choice of materials of the Frame and Backboard result in an extremely durable, impact resistant device, making it one tough unit. Built to exacting standards, the Lifeline ARM is manufactured to withstand small particulates and water spray and meets military standards for shock and vibration testing. Defibtech continues to provide superior value, design, and technical innovation in products with powerful features, functions, and ease of use. The results are truly useful products for helping to save lives. Whether on the ground, in an ambulance cot, or at the hospital, the Lifeline ARM is your solution for uninterrupted CPR. This is potentially a work place changing invention ! I would like to know how much this Automated device is? Thank you for your comment. We look forward to working with you! Why is this item no longer available ? Is it a FDA issue? And what did they cost? The Lifeline ARM is still available through Defibtech. You can contact them at 866-333-4248. No I did not Duplicate questions .